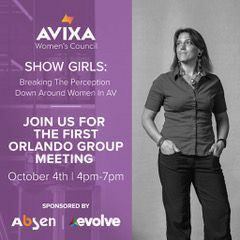 Orlando is the latest to be added to the growing list of local AVIXA Women’s Council Groups. The group's inaugural event will take place on October 4th at the Orange Studio near downtown Orlando from 4 p.m. to 7 p.m. The group will be led by Alison Maxson, senior manager, marketing, Absen and Ashley Dorst, marketing associate, Evolve Media Group. “It was a natural fit to focus our first Orlando meeting around the role women are playing in changing the AV tech landscape and increasing the opportunities for other women interested in making AV their career,” said Maxson. Maxon was inspired by Evolve Media Group's "Show Girls" photo series, which captured a core group of female AV techs discussing their career experiences in the AV industry. She reached out to Dorst to discuss creating a local AVIXA Women group and showcasing the "Show Girls" series at the initial meeting. “It was really amazing how much Alison and I were on the same page in looking at ways to encourage women in the AV industry in our area, so partnering up made perfect sense,” added Dorst. The event, which will include beverages and appetizers, is being sponsored by Absen and Evolve Media Group. To learn more information about the event and to register, visit bit.ly/2PIA5ez .